Last week for the first time we tried to visit the village of Naringgul, the southern border area of Bandung and Cianjur, West Java. through the route: Bandung – Nanjung – Ciwidey – via Rancabali – Lake Patengang towards Naringgul, with a distance of approximately 70 Km. the southern of Bandung, it does have a charm of the amazing view. Nature is still beautiful, and not much visited, make our eyes amazed to see it. The lush forests, lakes, crystal clear rivers, scenic waterfalls, make us all amazed. Naringgul area indeed Lovely. Centrally located, in the village of Sukabakti, and Balegede village, District Naringgul, Cianjur, bordered by the southern Bandung. For those who love and really enjoy the natural scenery, nothing wrong if you visiting this area Naringgul Region, in the South Cianjur. Landscape in this region is amazing. We will be treated to a wonderful view of several waterfalls that flow in fracture rock cliffs along this path. In addition, the journey to this Naringgul, we will find the typical scenery of the mountains, tea plantations, winding river stream, as well as terraced rice field.And of course, the charm of 1000 waterfall is the main attraction. The journey to this Naringgul, past Lake patengan, from here we will be treated to a view of nature, a very beautiful tea plantations. Winding road, the green tea plants, which is refreshing, farmers who use the tea plantations typical hat. Sometimes we passed with the truck carrying tea leaves to be processed. What a thrill. During the trip from Patengan, we will pass, hot spring, crater Rengganis, complex Cibuni tea plantations, mountain peaks, where we can see the beauty of Cibuni, along the roof of the houses are blue. And not less thrill is, winding road, which was known by the name of one thousand climbs (thousand inclines). which has many bends, and a fairly steep incline, other than the narrow path, we must be careful in passing this incline. Upon entering, climb a thousand, we will enter the forest Rasamala. The location of the gateway to this forest is located right in the border districts of Bandung and Cianjur districts. During a trip in the forest, we will pass a bridge, where we could see the cliffs above which is right on this bridge, we will see two waterfalls flowing, along with the black rock cliffs. pretty. After passing through the forest, the trip continues to decline, and we come to the village Balegede. Here is the location where we saw some beautiful waterfalls. The right place to see the waterfall is, in the corner where there is a tavern, which is right around the corner facing directly into the waterfall. The location that we can enjoy approximately 6 waterfalls flowing. The White flash of the cliff is a very refreshing eye. And one of the largest waterfalls called waterfall Cisabuk, or Waterfall Balegede. This waterfall has 2 levels, looks very exotic, and graceful. To reach the waterfall is very difficult. Because of this waterfall is located on the cliffs of the mountains, and are still very few people who can visit, but we were not disappointed because we found a waterfall precisely alongside a road that we passed and stopped to take pictures. along the way to the village of Sukabakti, our eyes will continue to be spoiled by the sight of several waterfalls at this location. Right on the cliffs, there are six waterfalls, on the left, there are 2 again. Gee, it’s like a trip to paradise. 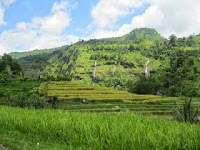 Due to the large waterfall in this region, then this Naringgul area, known by the 1000 charm of the waterfall.